Need Samsung WF419AA Steam Washing Machine Reviews & Ratings? 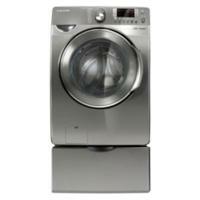 This is a solid washer which allows you to get all of Samsungs proprietary features without breaking the bank. Overall construction feels good and quality can be seen throughout. The system includes Samsung's Vibration Reduction Technology (VRT) via load balancing, SilverCare, also called ActiveFresh Technology which kills bacteria and fungus by releasing of silver ions and huge capacity of 4.3 cubic feet and spin speeds up to 1200RPM. If you have a large family with high load volumes, the extra capacity is a must. Even if you just throw in a few items, the WF419AA washer can sense the load size and match the amount of water used. This saves you money on energy cost in the long run. This unit is ENERGY STAR compliant. If you can sacrifice not being able to get this in stainless steel, give up 100 RPM and have 0.2 cubic feet less volume than the flagship WF44AAP Front Load washing machine, you can save yourself over $300. A great option if you ask us. Cycle time is 80 mins, average for this size machine. #1) Huge Capacity: At 4.3 cubic feet which will allow you wash a lot of laundry in one load. Larger capcity means less cycles and utimatly less time doing laundry. #2) Sanitizing Features: Samsung's proprietary SilverCare system emits silver ions to help sanitize clothing even in cold water. Great for washing dark colors in cold water to prevent fading over the clothes lifetime. #3) Sleek Styling: Samsung makes some of the best looking washing machines on the market and the WF419AA is no exception. Smart design is shared with the interface design which is easy to use right out of the box. #4) Quiet Operation: This is likely due to the Vibration Reduction Techonology (VRT) which balances the load to make sure there's no oven rocking. Samsung was also smart to eliminate gears and belts and make this a direct drive drum, also contributing to lower noise levels. Samsung washers with VRT are some of the quietest operating washers we've reviewed. #5) Design Details: The value is really in the details with the Samusng WF419AA Steam Washer. Samsung's gone as far as engineering their drum with smaller, recessed drain holes to reduce abuse on clothes. #6) Great Value: Given it's robust feature set, the WF419AA Steam Washer competes with top models from all major manufactures while saving a few hundred dollars on the purchase price. This washer has recieved excellent user reviews! Its difficult to find weakness with the Samsung WF419AA. This is a great washer which includes all the bells and whistles from Samsung's robust feature set. The machine is backed by a good brand and truly reflects great value. If you're in the $1,200 price range, this is a solid choice. FREE Delivery & Haul Away. NO Rebates, No Hassles. No Interest on Washers if Paid in FULL within 6 Months.